Every beginner and senior trader is sure to look for the best and most accurate way of predicting or analyzing trading to always profit. One in learning trading (Forex and Binary) for beginners is learning and knowing the current and future price patterns in a market movement trading. By being able to recognize the emerging price pattern, it is very helpful in predicting or analyzing the trends that will occur, so that's where we use it as a moment to open trading positions. One of the techniques of trading analysis is the price pattern or what is called in the cool language Price Pattern. On this occasion we will discuss it. What is the Price Pattern? Price Pattern is a pattern that occurs from a price direction movement, which consciously or not this price pattern always repeats. From time to time price movements always form a certain pattern that can be repeated again the next time. If we can find out the direction that will occur, of course, the open trading position that we choose will be profitable. Even though it is not 100% it will always be right, because basically there is no analysis technique that can guarantee 100% accurate, even senior traders. In a price movement in the market there are only two types of Price pattern that is reversal and continuation. Well, ... if it does not reverse direction, of course it will continue the previous direction. 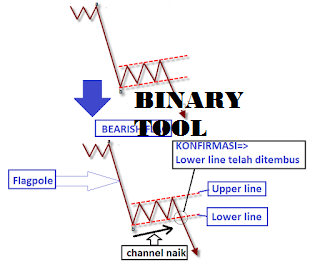 This is the key to trading whether it's forex or binary. Reversal That is a price that forms a pattern that indicates a trend reversal. Continuation That is a price that forms a pattern that suggests that price movements will tend to continue the direction of the previous trend. Double Top looks like two twin peaks (side by side) and Double Bottom looks like two twin valleys (side by side). It's easy to recognize these two patterns. Both of these patterns also have high accuracy potential. With the formation of a double top means that the 'base line' is also successfully penetrated. And the next movement can be ascertained to be reversed or potentially bearish. The possible bearish distance is as far as the peak level to the base. For example, if the distance between the peak level to base 50 pips, then the potential price will drop after the base is penetrated as far as 50 pips (from base to below 50 pips). 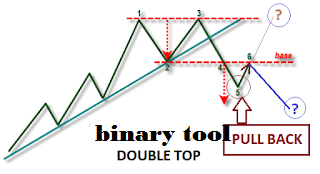 There is a time for a double top pattern when pull back occurs. Usually pull back will occur when the price movement has been 'halfway' 'towards the target. Example: if if the movement target is 100 pips, then if there is a pullback, when the price has fallen around 50-60 pips after the base is penetrated. In short, it is the opposite of the double top. 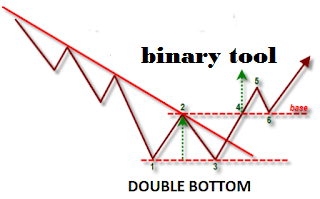 And the double bottom pattern usually occurs at the end of the downtrend and suggests a bullish occurrence. When the base line is broken and the double bottom pattern has been successfully formed (confirmed), there is a high potential for bullish. The way to predict exactly the same as the double top is just the direction up. The double bottom pattern is said to fail if the excessive pull back goes through the base line and goes down. Based on the picture above, the possibility of a Pul back starting from point 7 leads to the Base line. Keep in mind the occurrence of pull back like this even though quite often but not always happens. If the base is penetrated because the pull back is confirmed the pattern failed or failed. Please note: the three peak points (on the triple top) and the three valleys (on the tiple bottom) are not always at the same level (straight). 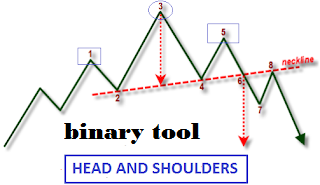 Both of these patterns are also quite popular because they have a high level of accuracy, called Head and shoulders because if they look at the shape of the pattern like head and shoulders. If in the triple top point 1, 2 3, tends to be level, but in the head and shoulders the midpoint or point 3 is higher than point 1 and point 5. If a pull back occurs through the bablas neck line line above, then this pattern is considered a failure. This pattern is the opposite of the head and shoulders. This pattern usually occurs at the end of the downtrend. For how to confirm it is exactly the same as the head and shoulders pattern. If this pattern has been confirmed then the price will move up as far as the distance from the bottom to the neckline line. If a pull back occurs through the neckline line and continues down, it means that this pattern is considered a failure. 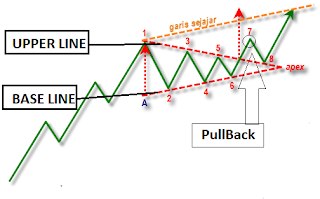 Continuation price pattern is a price pattern that is formed which indicates price movements will and still continues the direction of the current and previous trends. Or in other words this pattern indicates the trend will continue. Triangle or in Indonesian means triangle. This pattern is formed because the market moves sideways and the pressure between buyers and sellers is balanced, which ultimately graphs the price movement conical and forms like a triangle. The symmetrical triangle pattern does not have to have a four point reversal point, which consists of two peaks and two valleys. 6. If this pattern has been confirmed then the price will move up again. As usual, every pattern has a possibility of a pullback (the example above at point 7), if the pullback move down does not penetrate the Upperline and bounce it means this pattern is still valid. If an excessive pullback goes down through the Upperline line, then this pattern is considered a failure. Note: As a general reference the price must have penetrated the upper line for approximately 2/3 (two thirds) to 3/4 of the pattern length. The pattern length is the distance from the baseline line to the apex point. In addition to occurring when the symmetrical triangle pattern uptrend can also occur during downtrend, for the way to analyze it is also the same, it's just that the downtrend is pointing down. 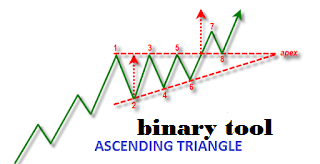 Actually the ascending triangle is not much different from the symmetrical triangle of how to analyze it. The difference is only in the form. 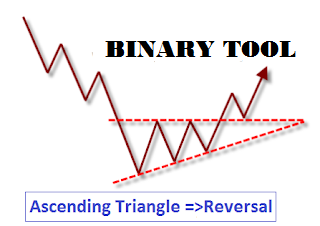 The ascending triangle includes a continuation pattern which often occurs in Uptrend price movements. With the emergence of this pattern, it indicates that the bullish pressure (rising) gradually exceeds the bears pressure gradually. The ascending pattern must have at least four reversal points (the example drawn has six reversal points). This pattern of confirmation is indicated by an upper line break that has the potential to be bullish. How to estimate the target that is the price movement after penetrating the upper line line will move as far as the distance from point 2 to the upper line line (see arrow in the picture). Even though the ascending is a continuation pattern, it can also be a reversal pattern if it occurs during a downtrend. If the situation or confirmation the upper line is penetrated so that the price that was down reversed goes up (bullish). 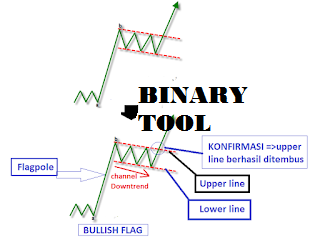 Bullish flag: Occurs after a bullish rally then a small channel appears forming a downtrend. 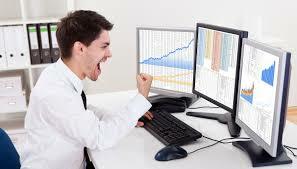 Rally is a price movement that tends to be long because of the strong pressure of sellers and buyers. To make it easier to understand, consider the picture below. This pattern is confirmed if the Upper line has been successfully penetrated by the price. If the pattern is confirmed, the price movement will tend to rise or be bullish. The way to determine the target is the rising price movement after successfully penetrating the upper line is along the distance of the flagpole (see picture) or the distance from point a to point b. If the distance from point a to point b (length of Flagpole) is 100 pips, then the target price movement after penetrating the upper line is around 100 pips. 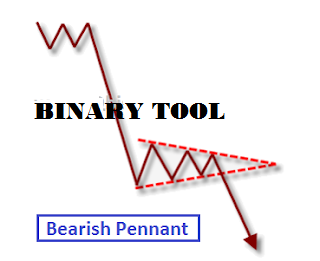 Bearish FLAG occurs when a downtrend then forms a small bullish channel. If the pattern has been confirmed, the price movement will tend to decrease or bearish. How to determine the target is the movement down the price after successfully penetrating the lower line is along the distance of the flagpole (see picture) or the distance from point a to point b. If the distance from point a to point b (length of Flagpole) is 100 pips, then the target price movement after penetrate the lower line around 100 pips. A rally must occur before a small channel is formed. 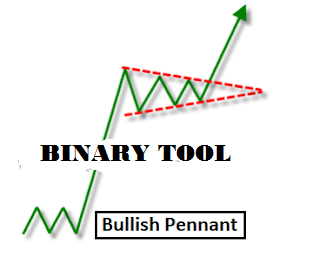 Pennant is actually the development of the form of a symmetrical triangle pattern. What distinguishes only the pennant occurs preceded by a long and fairly steep rally. You could say the penant is the result of a combination of symmetrical triangle and flag. Basically wedge formation is almost the same as pennant, the only difference is the slope of the second small channel in the same triangle, meaning the two lines are bullish wedge formation or bearish wedge formation. We can recognize the wedge pattern by looking at the slope that points up or down. 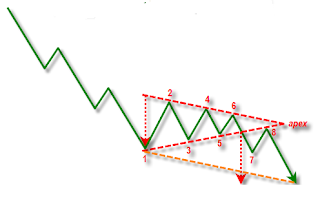 The slope of the wedge (small channel) as the continuation pattern in its direction must be contrary to the current trend. Although the wedge is actually a continuation pattern, the wedge can also function as a reversal pattern (although this is rare). Rising wedge can be a bearish reversal pattern if it appears at the Uptrend end. between two parallel horizontal lines. Some say rectangle as trading range or congestion area. Although the name is different this pattern still suggests a period of consolidation in a trend, which will usually be followed by a movement in the direction of the trend that occurred before. Arguably wedge formation is a pattern that occurs in a trend that breaks but then resumes that direction. 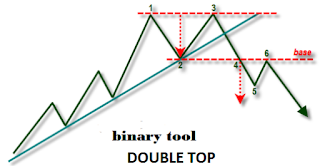 The inverse head and shoulders pattern appears at Uptrend. 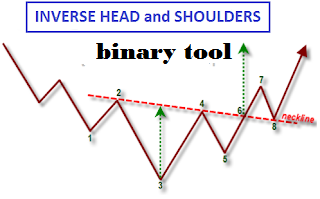 A break of the neckline line is a confirmation of the inverse head and shoulders Continuation Pattern. Supply and demand means supply and demand, which one offers is the seller while the one who plays the role of the buyer is the buyer. A price will be formed based on the law of supply and demand. When the supply of an item is high, but the demand for the item is low, the price will fall or fall. Likewise, the opposite. soaring up. In simple terms, if many are selling, but few buy, the goods are less salable, as a result the prices of goods will go down. Conversely, if many want to buy, but the supply of goods is limited, the item is selling well, and the price of the item will soar automatically.